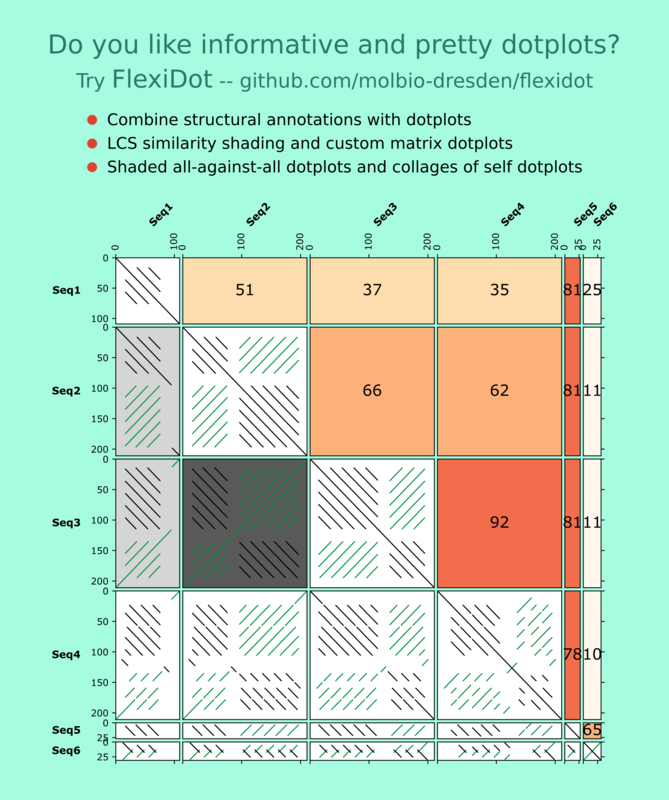 FlexiDot is a cross-platform dotplot suite generating high quality self, pairwise and all-against-all visualizations. 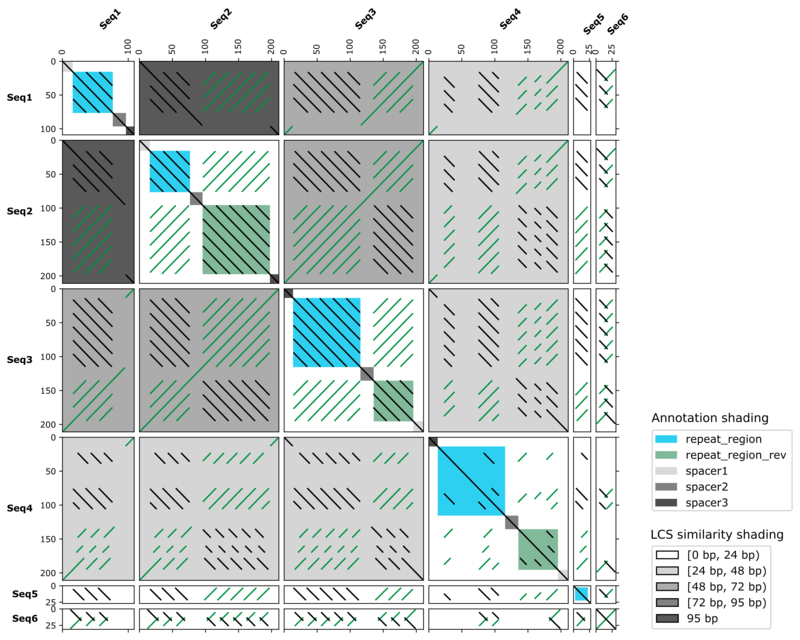 To improve dotplot suitability for comparison of consensus and error-prone sequences, FlexiDot harbors routines for strict and relaxed handling of mismatches and ambiguous residues. The custom shading modules facilitate dotplot interpretation and motif identification by adding information on sequence annotations and sequence similarities to the images. Combined with collage-like outputs, FlexiDot supports simultaneous visual screening of a large sequence sets, allowing dotplot use for routine screening. handling of error-prone SMRT reads and ambiguity-containing consensus sequences (e.g. derived by alignment or assembly). See for example this tutorial on adding gff3-type annotation to a dotplot. Annotation-based shading for all-to-all dotplots! Previously only available for self dotplots, we added annotation-based shading to all-to-all dotplots, allowing for new visualizations. As before, annotation information is provided as general feature file (GFF3). These features are added to the middle diagonal (see our example below). The example files are available. IMO, the best software for creating dotplots. Thank you a lot for saying this. It makes us happy, since we also love this tool. It would be great to have an option to display dotplots according to cartesian coordinate system (i.e., Y axis from bottom to top, rather than from top to bottom). Wow! That's great news. I'm looking forward to it. My best wishes to the entire FlexiDot team. Hello a.zielezinski, we just put forward FlexiDot v1.04 containing your suggested parameter -M/--mirror! Thank you very much. This feature is very helpful. I'm already showing FlexiDot to my students. We just released FlexiDot v1.04! This is a graphic formatting update introducing two parameters, one of them suggested here. Thank you a.zielezinski for your sharing your thoughts! As always, code, examples and documentation are on github at https://github.com/molbio-dresden/flexidot! It is also possible to combine both parameters and to receive all kinds of dimensions... Happy dotplotting!